NYX being a popular affordable makeup brand, but today I’m only here to share my thoughts and swatches of the round Lipstick and Lip Glosses that I own from this brand. I may not own all of them in the collection but I own enough and had used them enough to give my real honest opinions on them. My thoughts may not be the same as everyone else’s reviews since we all view products differently. I’m sure a lot of you are already familiar with the brand anyway. My swatches are not done on my lips because I find that the pigmentation of your own natural lip can alter the true colours of the actual lip products. Therefore I am just swatching them all on my arm to show the actual colour. However keep in mind that it may not turn out to be the exact same colour when applied to your lips. The round lipsticks are available at great prices and I have to say for the price they offer it at the lipsticks is definitely not bad at all. The creamy texture is great as it glides on your lips smoothly. Some of them don’t smell bad either so that’s also a plus for me. I just can’t stand lipsticks that have that super strong chemical smell to it. I get put off by the smell no matter how pretty the colour of the lipstick is. So I’m glad NYX don’t’ produce ones with those chemical scent to them. However my down side to these lipsticks are that they’re not long lasting so they do tend to wear off a lot faster when you compare them to other drugstore brands like L’Oreal or Cover Girl. Then that only means I have to do touch ups a bit more often then I usually do and I think I can live with that if the price is good and the pigmentation of them are beautiful. 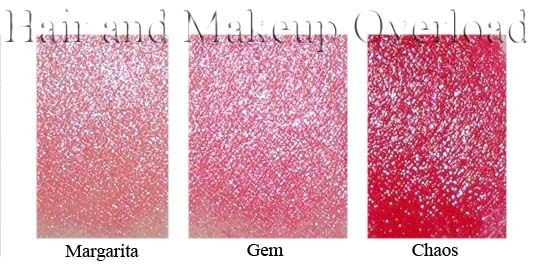 Note that none are matte shade and all has that pearl/shimmer finish to it. NYX Round Lip Glosses are one of my favourite glosses to buy and though the scents of them are not as nice as the lipstick they’re not horrible. Some do have an over powering smell but it’s not a chemical smell. It’s a very sweet smell where others have some other scent that I can’t quite pin point what it is. The texture is really smooth so it goes on well, however some of them tend to be a little on the stickier side. 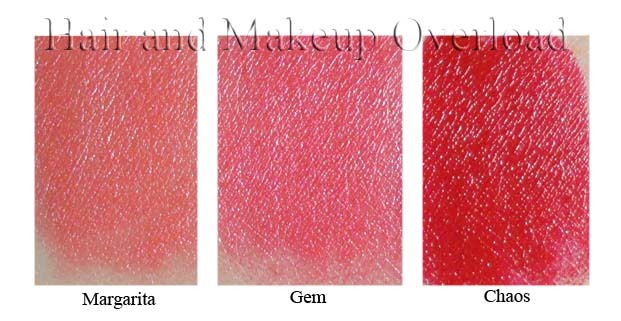 Some shades are rather sheer; therefore they add a great shine when applied over lipsticks. With the others that have good pigmentations are definitely wearable without lipstick underneath it. I find I often reach for a NYX round lip gloss more often when I’m on a run. Not only do they give me colour to the dull lips they also gives it that nice shine. These lip glosses are also very cheap and worth the purchase in my opinion. I’m also impressed with Sparkle which is a glittered lip gloss, the reason why is because most the time the glitter is really chunky and you can feel it on your lips. With this shade you don’t feel the chunkiness of the glitter and I like that. I’ve being loving Wild Orchid and Whipped a lot recently. They’re my on the go colours as they’re really pigmented and gives a great finish to the lips. NOTE: Colours are not 100% true to it colour as the lighting and camera used may not capture the colours properly. These swatches are done as reference for people who may want some basic idea of what the colours may look like. I can totally see myself getting obsessed with Inglot eyeshadows! I will definitely be getting another 10 square eyeshadow palette. Are their blushes and gel eyeliners as good too? Omg, I heard about the price increase in U.S and U.K aswell!! Saw it on GossMakeup's Youtube channel. That's why I'm thinking whether I should stock up on the eyeshadows soon before the price goes up? Becuase the 10 pan square palette is such a good price atm (about $8.50) and they are SO pigmented. I wonder how we could find out whether Aussie Inglot prices would go up? Which E/S colours are your favourites? Ooo their gel liners sound pretty good! I'm currently using Bobbi Browns gel eyeliner and Tony Moly cream eyeliner. Im going to try swatch some on my next visit. So many lip swatches to choose from. I think I'm gonna buy them all. Its hard to choose one after all.